I think this is the graph that best summarizes the gaps remaining for our FI, and they are massive. Still waiting for the exponential increase in asset growth and step down function for monthly spending. Monthly spending will continue to go down but will eventually plateau at ~$3,900 until the house is paid off, which it would plateau at ~$2,800 for a family of four. $210,000 left on the mortgage (20% paid off). Thinking about paying it off super quick in this overpriced stock market to get the monthly spending to drop. Opportunity costs could be high though so not 100% sure. My wife just told me living in an RV is not an option...at least she does not want the rental property anymore. Nice graph, simple and easy to understand. Do you calculate your house into the 4%? Or is it just stocks, bonds and cash, as you wrote? hi wolf. I do not calculate the house in the 4%. I thought about this for a while and think this is better for this type of graph. I see it as a reminder that we are not ERE until the house is sold and we downgrade in terms of $/month in living expenses. Not my best looking graph but it will do. Net Worth including equity on original home value and outstanding mortgage principal. With a comfortable emergency fund and (nearly) maxed out retirement accounts I think our best option at the moment is to get this guy on the positive side, and the best way is to pay down mortgage principal. 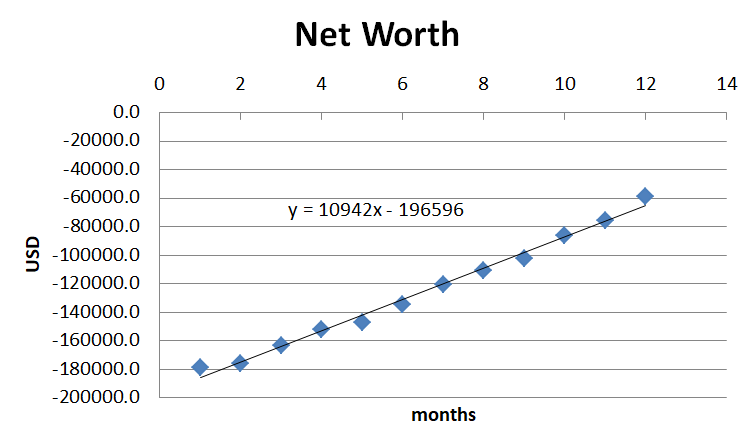 Will reevaluate the situation once this graph crosses $0 which looks to be about 6 months. Looking to be FI in 8 years. I hope the big market correction happens well before then. 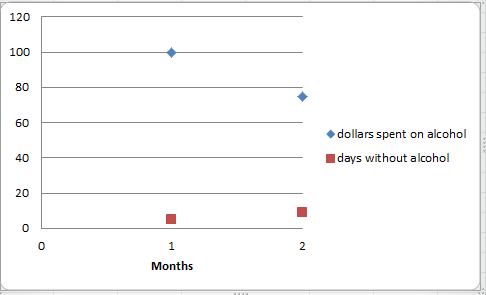 Time averaged our spending is now at $4411 / month. This should shrink down to and stay at $4000 / month in the next year. Health is how much money that is deducted from my paycheck each month, which includes a health spending account contribution. Lately we don't pay much more than the deducted amount in any month. Thankfully all spending has come down over the past several months after a big life transformation in 2016. The low hanging fruit is all gone though, now its the hard stuff, with the mortgage being the elephant in the room. We spent $100 in beer for March! About $80 of that was from me. This is the first month I have ever quantified this number but I think it fits in line with my estimates. I guess the logical thing is to just reduce the amount of beer consumed...still working on that..
You have seen the light and the progress since last year is pretty amazing. As someone who is a couple of years ahead of you in terms of discovering/applying these principles I want to encourage you and let you know that it works! Does your wife work? You income is very healthy, if its growth outpaces inflation and you continue to derive more utility from your money you will reach FI much sooner than you think. Thanks for the reply 2Birds. I saw the light maybe 4 years ago but I had a pretty big hole to climb out. For the longest time it was get out of debt, get out of debt! But now it is WTF do I do with all this money? Luckily I have been studying for a while but there is so much to learn. I am conservative with most of my predictions so the FI dates have a decent chance of getting pulled in especially if we sell our house later and move to a location with a relatively low cost of living. My wife has not worked for about 2 years now, probably won't full time for another 5 or so due to the little ones. She does all sorts of things though to keep our home in order that allow me to focus on work / managing assets like side hustles, community networking, finding free stuff, social coordinating, documentation, parenting, ect. Although in my dream world she would be able to do that and have a job but it just wouldn't be possible without outsourcing most of the work. In an ideal scenario just as I am burning out from my career she is ready to go back to work so that we have health insurance and income. this will be an interesting graph over time. 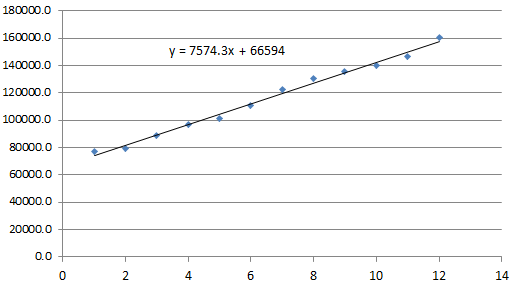 The ultimate goal is to have the two lines intersect (time averaged) and then I will definitely have leveled up. I rarely go to bars / tap-houses anymore and I won't switch it up to moonshine to save costs. I now see the lines intersecting as a prerequisite for early financial independence which of course means more than having a bunch of money in the bank. Basically consuming alcohol will need to become more or less a social activity rather than a daily unwind. Let's see how this goes. $80 for beer / $9 per six pack (the price where I'm at) = about 9 six packs. 9 six packs x 6 beers per pack = 54 beers. 54 beers / 31 days in a month = less than two beers per day. Is that about right? If you want to save money in this area maybe cut back to one beer a night or replace a couple of the nice six packs with something more generic. I'm in the same boat with drinking. I have 3-4 beers a night, which if you add it up is insane. Even if it's 4-5 nights a week it adds up to ~60-80 beers a month. I probably spend ~$100/month on beer. I drink a good deal too, because it feels fantastic. Drinking + lots of exercise = yes. My biggest non ERE burden that I carry is home ownership before FI. I agree with the concept of renting as cheap a place as possible and then if you want buy a home with cash once you are FI. But since my wife 100% thinks owning a home is what you should do (and we have already bought one) I am stuck with a mortgage until we pay it off, likely within 7 years. By that time we should be really damn close to FI. Ever since I started calculating monthly expenditures I have been counting our total mortgage towards our monthly total. Recently I have done some creative financial accounting and decided mortgage principal paid should not go to monthly expenses, thus decreasing our SWR. Folks say owning a home is not an investment but it sure ain't like being in student loan debt if done right. I think this is the best way to factor in home ownership in you FI score card. Or at least the one that makes me feel best about having a mortgage. SWR just went from 44% to 37%. Small gain by creative accounting but I'll take it! I just read this thread and I may have missed your age and if you have children. I feel this is also similar to one holding losing stocks and sunken cost theory or whatever that is called. Hard to make changes against inertia. Good luck with the progress..as long as you are moving positively on the S curve life is good, no matter how long it takes to reach the goal..
Decided to stop working as many hours at work, from around 60-65 hours / week to 50-55 hours / week. They have somehow instilled fear of losing ones job to all the employees but at this point I could care less if they let me go. Thinking about working extended hours on the weekends now makes me want to throw up. We have 7 more years to go until FI so this makes me slightly nervous about how I will be acting with only a few more years to go. I should be able to get another job easily it just won't pay as much. I guess worse case scenario I work a few more years to make up for lowered salary. I received a bit of good news a couple days ago. My wife decided that being a stay at home mom is not something she wants to do for much longer. This has been a touchy subject between us for about a year now but I haven't brought it up for at least 3 months so this was good to hear. Her biggest complaint was how much other stay at home mom's complained about everything and gossiped. Another motivation was to get our family closer to FI in a shorter amount of time so we can live in an city / country that more aligns with our values. The final motivation was that she felt like she needed more from life. Hearing this truly put a smile on my face, mostly because I am selfish and want to be early FI. Is it selfish to want to be FI? I guess you're either being selfish or being prudent. Macro asset allocation is my more interesting graph lately. We made a big push recently to make a dent in our mortgage but for the next 6 months or so we will just make minimum payments to bring it more to the 25-30% range. The extra money will go towards after tax accounts which definitely need a boost (the reduction 8 months ago was from selling company stock). Will build up gold to maybe 5-10% from its current 2% while also trying my hand at conservative individual stock picks. Cash and 401k allocation will roughly stay the same. Your graph looks like a witches claw. I recommend drinking more alcohol. I think the biggest factors to continued success are my proximity to work which allows me to run without significant efforts and the fact that our building has an on-site gym (and shower). Since I have to start work at a very specific time I try to be as efficient as possible in the gym which goes perfectly with barbell exercises. If I wake up later I just spend less time in the gym or skip it altogether. If I am up early I spend more time in the gym. Biking to work is less optimal than running because at my distance I hardly broke a sweat on the ride, but if I ran I was sweating a lot. They took about the same time anyway because of the short distance. Because of this routine from the past 6 months I can say I am in the best shape of at least the past 10 years of my life if not 15 years. If you have a family and job morning exercising is the best way to establish and commit to a routine. Get sober. Although I am no longer the same person from college, and I definitely made improvements in 2018, I want more in 2019. There are too many skills I want to improve outside of a demanding job and family and I need to be hyper-focused to make gains. I am also not super happy with my job so I am hoping this helps with my day-to-day mood. Not to mention this could save me around $600 / year that I could apply to more productive endeavors. The above is my only "New Years" goal for 2019. I think if this works out everything else will fall into place. I started using personal capital a couple months ago and mostly I think it is great, especially for tracking overall portfolio performance. Currently I am sitting on a couple $10k more in cash / short term cash equivalents than is showing up on this asset allocation. I have been setting us up defensively for the past 8 months or so and will continue to add more to cash equivalents. 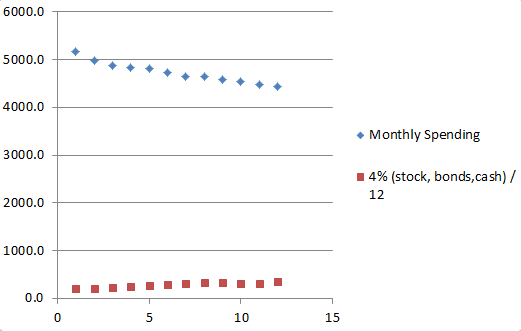 Definitely more nervous about losing principal than missing out on stock returns at this moment. If stocks keep climbing from their recent lows I will pull more out of the stock market to try and lock in gains. Either way I need to get my picks ready for when the market eventually takes its needed dive. Some guy opened up a bike repair shop 5 minutes walk from my home about 3 months ago. He has been in business for 3 years then moved to a warehouse location nearby. Local bike stores are closing but his model might work out because it is low overhead...just a guy and his girlfriend fixing bikes and selling parts in a garage warehouse. I have a bunch of needed bike work to do.. I'll get all my parts from him and try and pick his brain. Biking 10 miles a day as part of a new commute. This could be the summer I level up my bicycle repair skills.